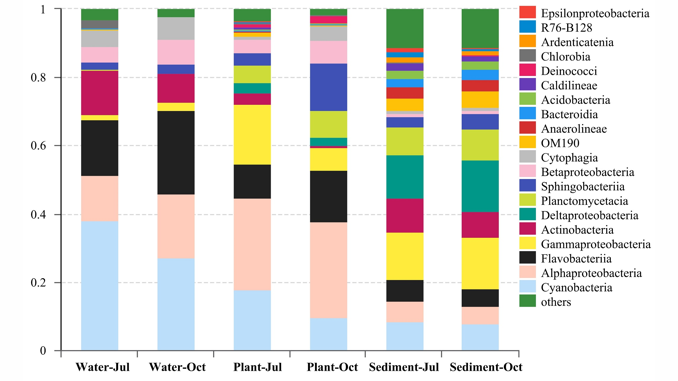 In this study, we conducted a comparative analysis of the abundance and diversity of bacteria on the surface of the submerged macrophyte Myriophyllum spicatum, as well as in the surrounding water column and sediment in the low-salinity area of Hangzhou Bay, China. Bacterial clones from three clone libraries were classified into 2089 operational taxonomic units (OTUs), most of which affiliated with bacterial divisions commonly found in marine ecosystems. Alphaproteobacteria, Cyanobacteria and Gammaproteobacteria were the most abundant groups of bacteria on the surface of plants, in the water column and sediment, respectively. Epiphytic bacterial communities were more closely related to those in the sediment than bacterioplankton, and some species of epiphytic bacteria were found only on the surface of M. spicatum. The relative abundance of epiphytic bacterial genera associated with breakdown of organic compounds and with cellulose digestion was higher in October than that in July. These results suggested that bacterial communities on the surface of M. spicatum may originate from sediment bacterial communities and their specific structure was gradually formed on the surface of M. spicatum after being cultivated in low-salinity seawater.